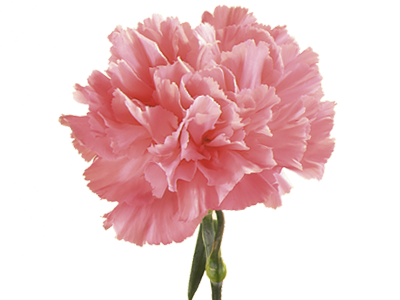 With a history that dates back more than 2,000 years, it's not surprising that carnations are rich with symbolism, mythology and even debate. While some scholars suggest that their name comes from the word "corone" (flower garlands) or "coronation" because of its use in Greek ceremonial crowns, others propose that it's derived from from the Latin "carnis" (flesh) referring to the flower's original pinkish-hued color or "incarnacyon" (incarnation), referring to the incarnation of God-made flesh. Today, carnations can be found in a wide range of colors, and while in general they express love, fascination and distinction, virtually every color carries a unique and rich association. White carnations suggest pure love and good luck, light red symbolizes admiration, while dark red represents deep love and affection. Purple carnations imply capriciousness, and pink carnations carry the greatest significance, beginning with the belief that they first appeared on earth from the Virgin Mary's tears – making them the symbol of a mother's undying love. Worn on Mother's Day, Teacher's Day, St. Patrick's Day (in green, of course) and at weddings, this hardy, sweetly fragrant flower is also the state flower of Ohio, the January birth month flower and the 1st wedding anniversary flower.